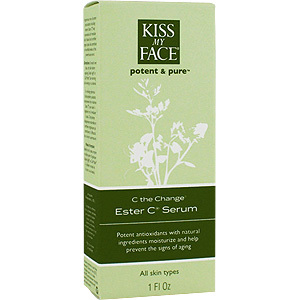 87% Certified Organic ESTER C SERUM. A generous mixture of potent antioxidants - including patented Vitamin Ester C©, the leading antioxidant - to stimulate collagen production, refine wrinkles, and to heal and rebuild damaged skin. Declining levels of Vitamin C make skin tissue susceptible to free radical damage and slow the repair and synthesis of collagen. Ester C in our special serum goes to work immediately upon application. It's the most stable and effective form of Vitamin C. Essential citrus aromatics contribute to the effectiveness of this anti-aging powerhouse serum. C The Change - is shipped in a discrete, unmarked package. Orders are processed immediately and usually take about 3 to 5 working days to be received. We do ask that you try it for 2 to 3 weeks to feel the full effects. Any information received is used only for order processing and shipping purposes. Your information, such as e-mail address, will never be disclosed to a third party.